That’s right folks, Blackie Lawless and the boys are hitting Dublin tomorrow night for the second time in less than a year. The boys are still touring their 2009 album Babylon but there’s plenty of older hits in there like On Your Knees, L.O.V.E. Machine, Chainsaw Charlie and many more to keep all fans happy. Gig’s happening in the Academy and if the crowd at Exodus last week is anything to go by, then recession or no recession: this show will be packed. 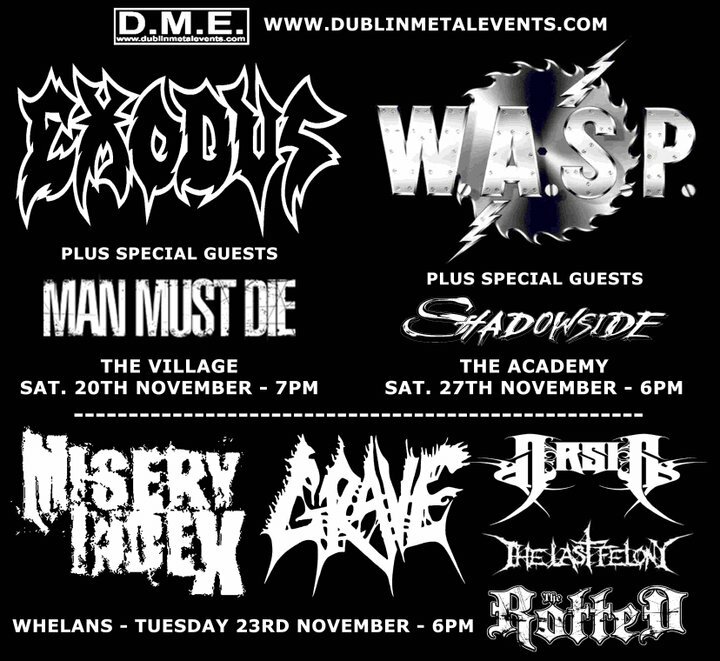 Dublin Metal Events presents W.A.S.P. tomorrow night in The Academy, Middle Abbey Street Dublin tomorrow night with tickets priced at €23.50. Support from Shadowside. That’s not all folks, D.M.E. have a pretty savage winter lined up for all you heads out there meaning Fibbers, Brux and Gypsy Rose won’t be going out of business any time soon. Here’s just a few of the shows they’ve got planned. 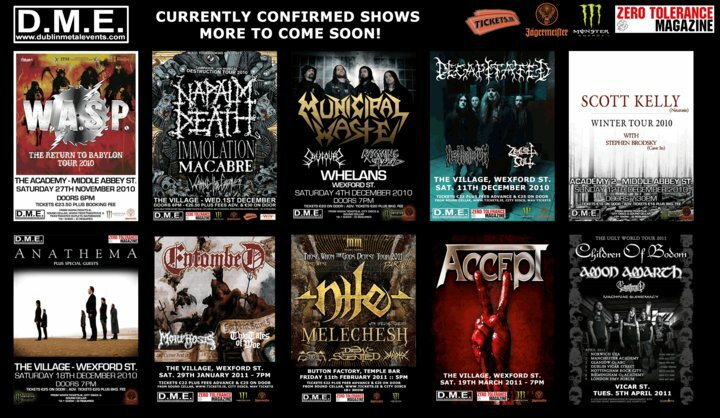 All details for each show can be found on Dublin metal Events Official Website (Click here). 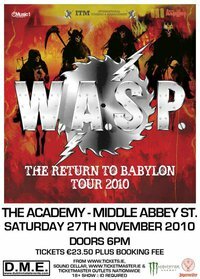 Meanwhile Tickets There will be the ones robbing the Exodus / WASP poster tomorrow! This entry was posted on November 26, 2010 at 5:09 pm and is filed under Music, News with tags Accept, Amon Amarth, Anathema, Babylon, Blackie Lawless, Children of Bodom, D.M.E., Decapitated, Dublin Metal Events, Entombed, Immolation, Macabre, Melechesh, Morphosis, Municipal Waste, Napalm Death, Nephridium, Nile, North Atlantic Oscillation, Ramming Speed, Saviours, The Academy, The Button factory, Two Tales of Woe, Vicar Street, Waking The Cadaver, WASP, Zealot Cult. You can follow any responses to this entry through the RSS 2.0 feed. You can leave a response, or trackback from your own site.